This title was first published in 2003. This book provides an innovative, fresh approach to entrepreneurship. It puts forward a flexible, expansive conceptualization of the continuum of entrepreneurial behaviour and integrates context, culture, social networks and entrepreneurship as an embedded activity. Motivated by a desire to bridge traditional academic boundaries the editors craft a heterodox perspective which interweaves strands from feminist and new institutional economics, sociology, management, finance, marketing and social policy. Contemporary themes of major significance highlighted include the importance of new technology, ethics, culture and identity, and entrepreneurship for indigenous, younger and older people as distinct groups. 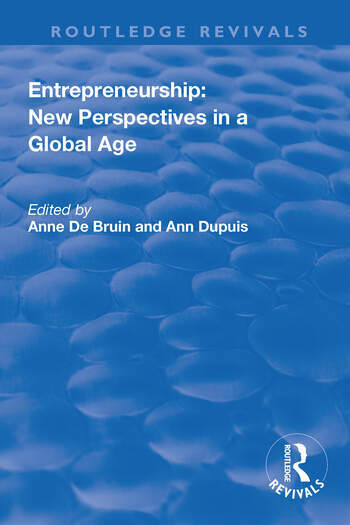 Contents: Introduction: concepts and themes, Anne de Bruin and Ann Dupuis; Constrained entrepreneurship, Anne de Bruin and Ann Dupuis; Ethical entrepreneurship, Chris Moore and Anne de Bruin; Entrepreneurial capital, Patrick Firkin; Electronic entrepreneurship, Anne de Bruin; Familial entrepreneurship, Patrick Firkin, Ann Dupuis and Anne de Bruin; Community entrepreneurship, Ann Dupuis and Anne de Bruin; Municipal-community entrepreneurship, Ann Dupuis, Anne de Bruin and Rolf D. Cremer; State entrepreneurship, Anne de Bruin; Indigenous entrepreneurship, Anne de Bruin and Peter Mataira; Elder entrepreneurship, Anne de Bruin and Patrick Firkin; Youth entrepreneurship, Kate Lewis and Claire Massey; Index. Anne de Bruin, PhD, is Professor of Economics in the Department of Commerce, Massey University at Albany, Auckland, and the Director of the Academy of Business Research, College of Business, Massey University, Auckland, New Zealand. Ann Dupuis, Senior Lecturer in Sociology, School of Social and Cultural Studies, College of Humanities and Social Science Massey University, Auckland, New Zealand.